A single device to control and manage all functions of machine automation: it’s the ESA Automation Task Motion. Presented during SPS Italia 2018, it’s a complete solution that integrates our industrial automation technologies and the know-how we acquired with Elcon and Selema. 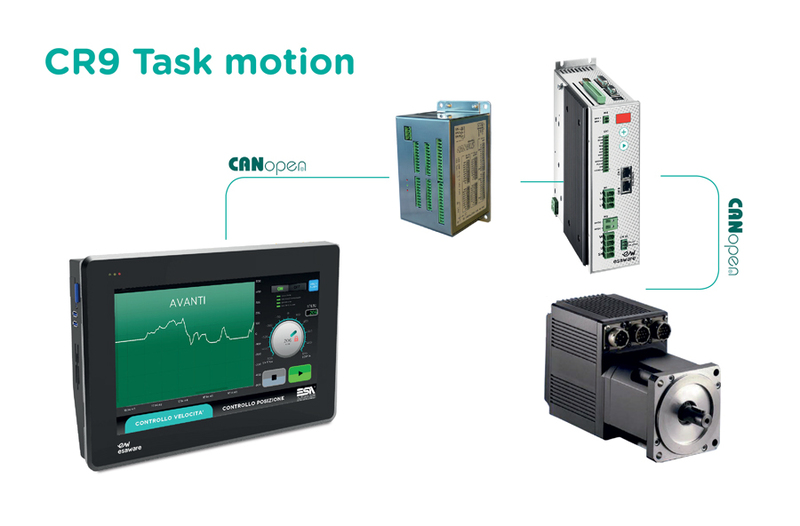 The latest addition to the range of ESA Automation solutions, the Task Motion ensures flexibility, openness to third-party hardware and software, and the opportunity to largely customize any project. Programming takes place through our Crew SCADA, which offers a development environment capable of integrating HMI, Soft PLC and motion control. In addition, users can decide whether to create their application on their own (with our training and support) or to trust the ESA Automation development team in order to get a ready to use application. As for communication with the field, we provide two CANopen and EtherCAT guidelines. In this way, the customer is free to choose the bus he prefers depending on the devices he wants to use. With its Task Motion, ESA Automation aims to integrate the typical functions of the motion control with the principles of Industry 4.0 and company digitalization. In fact, through the operator interface (operator panel or industrial PC), you can communicate with the Cloud and with our remote assistance platform Everyware. Our goal is to promote the development of an increasingly efficient and connected production plant, through a complete solution that is easy to use and highly customizable according to the needs of each customer.